The ecological effects of snowmobile activity on wildlife are increasingly a concern for resource managers and planners, yet little is understood about the implications for predators, particularly wolves (Canis lupus), and the dynamic role that OSV (over-snow vehicle) trails can have on predator-prey interactions. As of 2003, there were more than 2.4 million snowmobiles registered in North America, 34,000 of which were in Alaska (International Snowmobile Manufacturers Association, 2003). The production of lightweight, fuel-efficient snowmobiles in the mid-1990s has expanded snowmobile activity into areas where little or no activity previously existed. OSVs and the alterations made to the landscape from their activity can have profound impacts on wolf-prey dynamics. The presence and noise from OSVs could displace and disrupt animal activity and movement patterns while the creation of trails could allow energy-efficient travel (and increase the likelihood of encountering and successfully capturing prey). High hunting and trapping pressure could exacerbate these effects, particularly during critical periods such as late winter when animals are most stressed and anthropogenic activity is greatest. Beginning in October 2004, the Alaska Department of Fish & Game (ADF&G) and University of Northern British Columbia (UNBC) in cooperation with the Bureau of Land Management began addressing the ecological implications of OSV activity on predator-prey interactions in the Nelchina basin (Game Management Unit 13) of South-central Alaska. 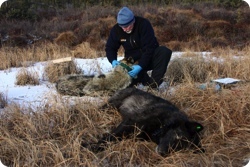 With its dense network of trails and the increasing predator management program, the Basin presents a unique opportunity to quantitatively assess the spatial and temporal relationships of wolves, human activity, prey resources, and snow characteristics. By use of Followit Tellus VHF GPS collars, interesting information about animal movement has been documented (see figure 2). It is anticipated that this 2-year research project also will begin to provide an essential component in unraveling the complexity of factors that affect ungulate survival, as well as, provide a baseline for future investigations into the energetic implications associated with anthropogenic activity. 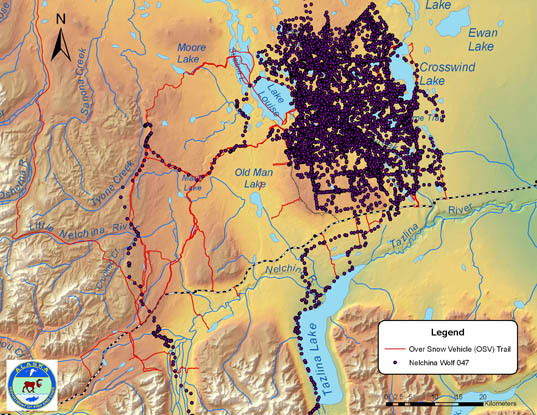 Figure 2 Map showing wolf movement and over snow vehicle tracks.